We’re student-centered. So you’ll be patient-centered. How do you produce new generations of health care professionals who will put their patients at the center of everything they do? At Kansas City University of Medicine and Biosciences, we believe it’s a matter of leading by example. That’s why we put our students at the center of everything we do. In fact, our second century in medical education is wholly dedicated to continuously improving and investing in our students’ experience. Our College of Osteopathic Medicine, offered at both campuses, provides you the education you need to become a highly competent and compassionate osteopathic physician. Our College of Biosciences, offered at our Kansas City campus, provides you the skills necessary for a successful and meaningful career in psychology or biomedical sciences. Your dream may be to make a difference in the life sciences as a physician, psychologist, researcher or scientist. Our mission is to help you realize that dream by offering the highest quality educational programs that prepare you to meet the health care needs of the future. At KCU, you’re more than just a score. While our requirements are competitive, we’re looking for well-rounded students with real-life experience. Check out our requirements to get started on your path to KCU. Whether you’re looking to pursue a career as psychologist or a research scientist, KCU-Kansas City’s College of Biosciences has the program for you. Helping to address health needs within our regions. Nestled in the  southwestern corner of  Missouri, the city of Joplin is home to approximately 50,000 people with 400,000 people living in a 40-mile radius, making the city the 4th largest metropolitan area in Missouri. With a quarter of a million people coming into the city for work or health care daily, Joplin is the medical hub in the South Central U.S.
KCU-Joplin is the first medical school campus in the southwest region of Missouri and places a strong emphasis on patient-centered primary care and rural health to help address the growing need for physicians in the area. When asked, students say one of the biggest reasons they chose KCU-Kansas City was the community – among students, faculty, staff and our Northeast neighbors. KCU has called Kansas City home for 100 years. Beginning as a College of Osteopathic Medicine in 1916, KCU-Kansas City has grown to include a College of Biosciences during the past decade. Located in the heart of Kansas City, you’ll have the opportunity to give back to our neighbors through outreach efforts as well as explore the eclectic communities surrounding our beautiful campus. If you've ever asked yourself, "How can I make sure my gift reaches its full potential?" or "How will KCU students realize my support?" 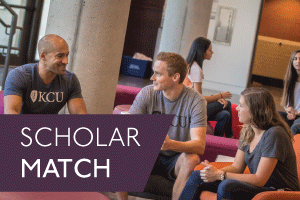 you'll find an answer in the KCU Scholar Match. Stay in touch with friends and network on Community KCU, a social website dedicated to connecting KCU alumni. Search and find friends using the alumni directory or start a conversation on your class page. Join today.